Melinda's Fabric Fancies has a giveaway for a $45 CSN store certificate. I am planning to win it. Ha ha... So don't even go over there. If you missed my last couple of posts, please go back and read them. Two posts back I did a video of how to cut bias binding. Yesterday the second commenter asked a question. Sadly, Teresa is a "no-reply" blogger, so I can't answer her directly. The cutting mat in the video is an Alvin mat that was originally bought for art, not quilting. I also have a green Olfa (I think) cutting mat. I have several brands of rulers. The ruler in the video is a Quilt Sense ruler. My favorite is an Olfa Frosted Advantage; it doesn't slip and it easy to read on both dark and light fabric. I also have rulers by June Tailor and OmniGrid. The other I would like to try is the True Cut ruler by the Grace company. It needs the True Cut cutter to work properly. It has a track on the ruler that the cutter rides on to keep your cuts true and straight. Again, if the Grace Company would like to send me one to review, I would be most happy to try it and give an honest review. As promised, here is the video tutorial for cutting bias binding. A number of people cut straight strips for binding. I did that too, until I learned this technique from Pat Wys of Silver Thimble Talk. I think I told you earlier that Pat showed Pat C. and I this method using a napkin in a restaurant in Atlanta. That restaurant had some interesting decor too. This was mounted to the ceiling right above our table. You just never know what you will see in Atlanta. Ha ha. photo courtesy of Pat C.
Why is bias binding better? Number one is strength and durability. The bias is more durable. There is a good reason why the bias binding lasts longer. With a straight of grain binding there is one thread that basically runs along the edge for the length of that strip. When/if that thread breaks, the fabric is weakened and can split more easily. With a bias binding, you have multiple threads that run only short distances; thus there is always less stress on any one thread. You put a lot of work into making a quilt. So bind it with bias so that it lasts and lasts! Your future family members (or those of the recipient of the quilt) will be so glad you did. 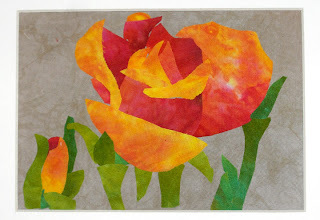 This video will also be accessible on the Videos- Quilting tab on my blog. Thanks to BOTH Pat Wys and Pat C. for a fun day with some education thrown in to make it even better. 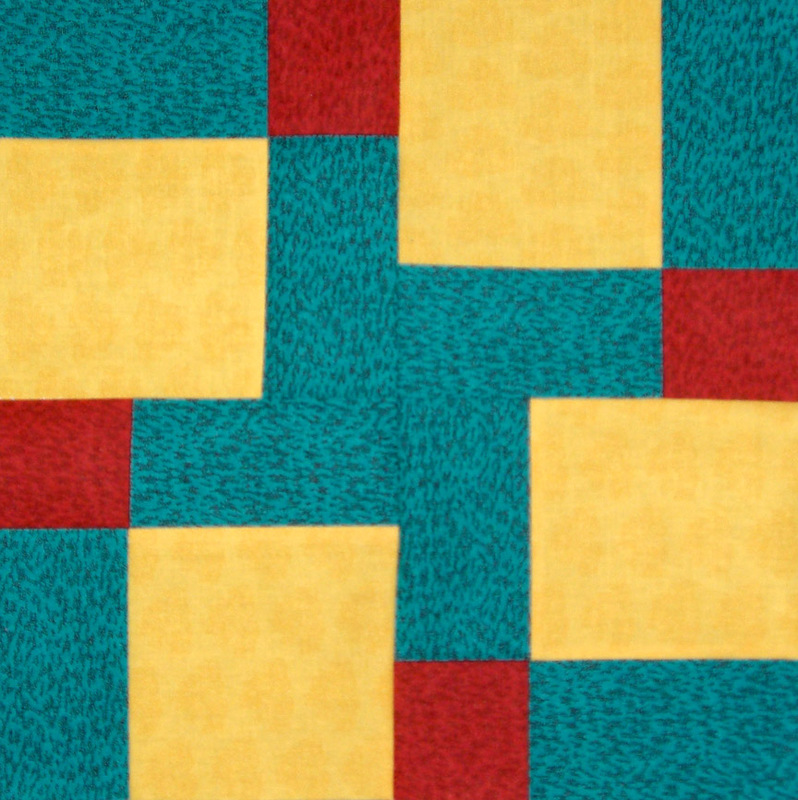 Late Addition: I think I cut one or two more strips sections.This piece of fabric was 26 -28 inches wide when I started. I got roughly 300 inches of bias. This will bind a 70 inch square quilt. I had leftover fabric also. I saw video below on another blog and it so precisely explains "Why I Quilt" that I had to share it. I happen to be a painter also. Each process is creative, each process feeds my soul and my need to create. Why do I "need" to create? I was reading a book by Madeleine L'Engle ("Walking on Water") and found that "why" in the text. For me, it explains why in a way that makes sense. I don't have the exact quote, but it goes something like this: I am created in the image of God, the creator. I am in the image of a creator so to fulfill that image, I NEED to create. 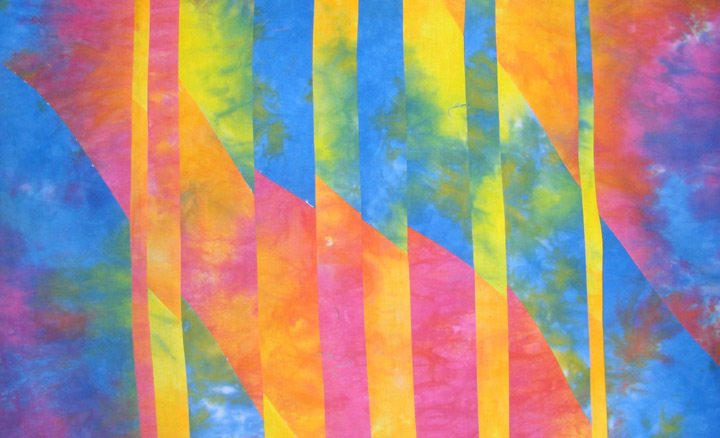 Okay, here is the video of Bonnie Hunter explaining why she quilts. Just imagine it is me saying the same things. 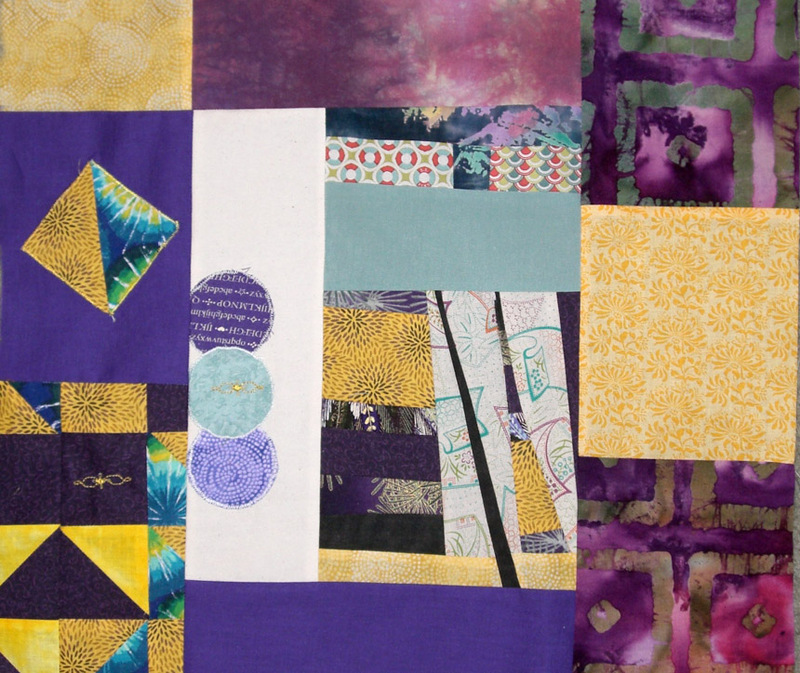 The Layer Cake Quilt Along Block Nine was designed by Jovita Goldschmidt. There were four choices for layout on this block. I decided to make a 5th choice. She called this block "U Pick"; so I picked an "off the board" option and made it my own. All of the designer's choices were fully symmetrical. I chose to make it mirror image symmetrical. My version looks different if turned sideways. My peculiar brain wanted to play with the pieces a bit, and when I saw this layout, I liked it. I have not forgotten the tutorial on cutting bias binding. I will post it once I have pictures and/or video. Sorry for the delay. Let me tell you that I learned something wonderful. I can cut bias binding in minutes with no agonizing or using the angled mark on the ruler. 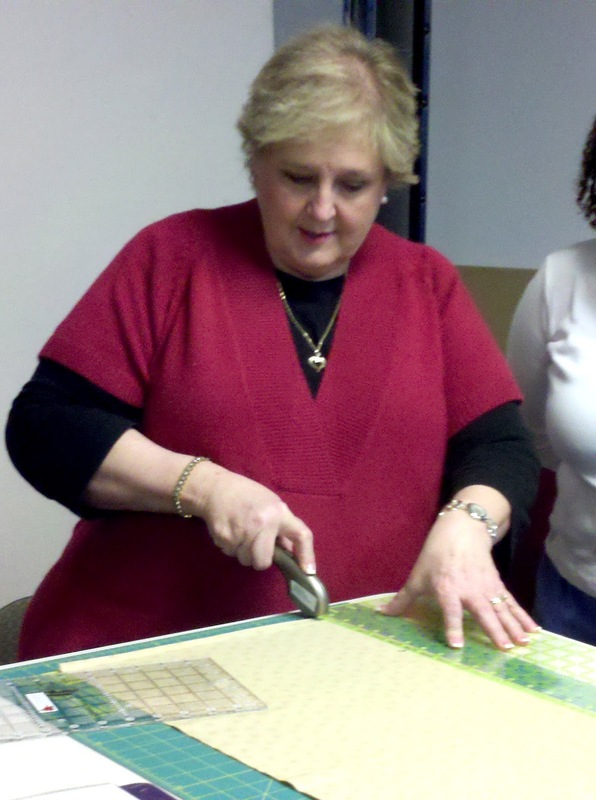 As I mentioned yesterday, Pat Wys showed Pat and I how she cuts bias binding. I had my paper towel example and looked it over really well. Then I took a piece of fabric I wasn't crazy about and did a test run. It worked! So I got the fabric I had chosen for binding my signature quilt and cut it for real. Cutting it took maybe ten minutes including the ironing time. Seriously! I was amazed. I cut a lot of binding too. This is the leftover, after I had bound the quilt. You can see that I put it on a little roll and made a "necklace" to wear while sewing on the binding. That kept it from getting all tangled and dragging while I was attaching it. After I got it sewed on, I flipped the quilt over and machine stitched the binding down on the front. That allows me to keep the stitching on the front perfectly aligned. Well, it would be perfect if I hadn't been watching television. 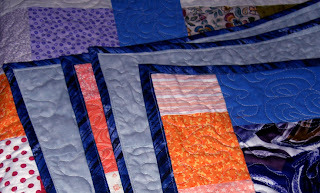 Now, I have one thing to say - it is way easier to sew bias binding on the quilt AND the corners miter much more easily. Oh, and I understand that it wears better and lasts longer. I really like that idea! I plan to do a tutorial on cutting the bias binding in the next week or so. Thanks again to Pat at Silver Thimble Talk for the lesson on cutting bias binding. I can tell that I have been too quiet. I am getting emails asking if I am okay. (guilty errr caring parties know who they are!) I am doing fine. I have mostly recuperated from my nasty old cold. I am just taking it easy for a few extra days. This weekend we are going to visit The Nana at the beach. I am hoping the warm ocean air will be a complete restorative to both my body and my creative soul. As for projects on the back burner, I am shocked at myself. I found one quilt folded neatly. 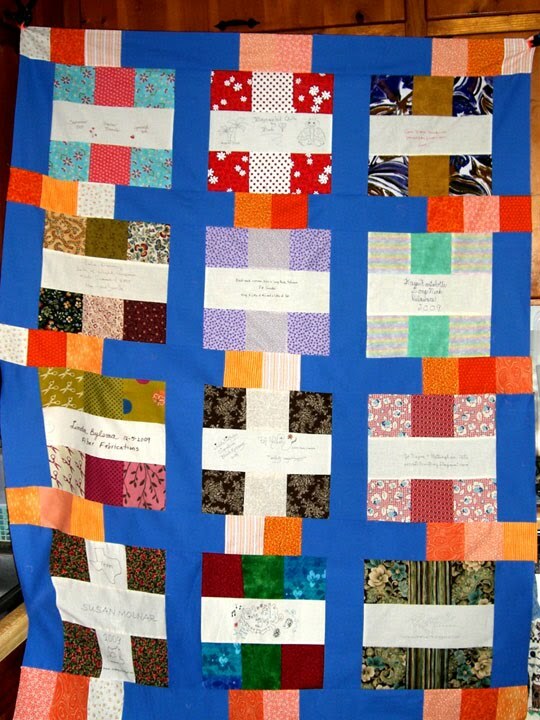 This quilt is a special memory quilt for me. I realized that it has been waiting patiently since January of 2010 for a binding. That is a priority on my list. Wanna see it? Okay. Some of you will remember it for the simple reason that you made a block for it. It is layered, quilted and looking absolutely wonderful. But it needs a binding. I will go to the stash and see what I can find. I am planning to cut bias binding like Pat Wys showed Pat C. and I on our Atlanta outing. I have a folded paper towel (from the restaurant) with instructions on it. I hope I can remember the details. Ha ha. 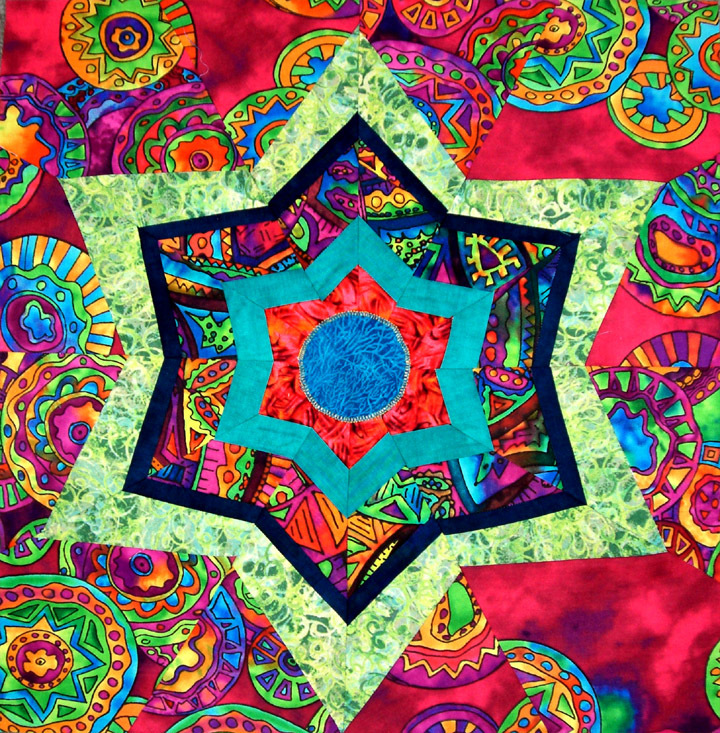 I have the Trip Around the World piece that I made, the Convergence Quilt, and The Kaleidoscope block all waiting to be made into finished products also. Oh and then there is this that most of you have not seen yet. I have started a fusible applique piece for my niece. 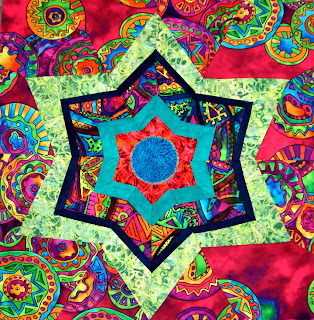 I also have a million ideas and plans to make quilts. Where will I find the time??? If you happen to find a big stash of "extra hours in the day" please consider sharing them with me. Have you ever lost a project when you did a cleaning or reorg day? I did! I had been doing the Stay at Home Robin project hosted by Kate North. I had managed to finish step five in November, then I am sure while finishing up for the big sale, I "put it in a safe place" - so safe I couldn't find it again. Until today, I was shifting a something and - OH My, there it was!!! Did I mention I am doing two of them? I figure maybe one of them will be something I like. Ha ha. So I pulled them out, ironed them, and proceeded to do rounds six, seven and eight. Here are the finished products. Round eight had this instruction: "Applique or embroidery something on your top. " So on the first one there are two rather small embroidered bits. But on the second one there is a big pink star that I appliquéd on the yellow square. Now I will rest again for the evening. The cold is slacking up and I don't want to push myself. 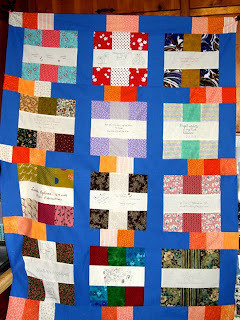 This is from the lady that teaches the online quilting class that was a prize in this giveaway back in December 2010. I would cut 2 1/2" triangle pieces with the value die rather than cutting the 2 1/2" strip and doing the pressing. One thing that I do differently is that I like to always press those seams open before I join seams together. I think it makes it more accurate. On a different note, I am still suffering with this nasty cold. Sorry I haven't posted for a few days. I am just spending my energy on making it through the days. Sick but not totally out of it. I am just a bit under the weather with a sinus-y cold. So I have been less productive. 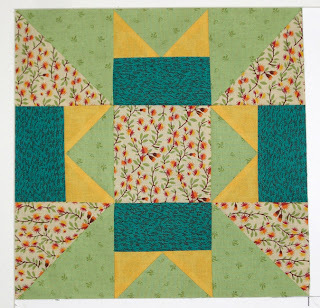 I didn't make the Layer Cake Quilt Along Block 8 on the day it was released like I usually do. I made it this afternoon and even though it was easy, I am tired already. And just for fun, I am entering my Kaleidoscope block in the Quilt Story Block Party. Now I am going either to bed or to my recliner. I hate having a cold. But at least I am better today than I was yesterday. Tomorrow I plan to be back at work. (and I need to remember to take the soft facial tissue with me, just sayin') Wish me well. A while back a dear friend sent me a kit. Somehow it got buried and forgotten. This past week I found it. Then I traced the templates, adding the quarter inch seam allowance, and cut them out. Tonight I finished sewing it. The center was "less than perfect" so I appliquéd a circle over the center. It is still less than perfect, but hopefully I will find a place to use it where it will shine. This is going to be a rather short post, but several people wanted to see my purchases from the ATL mini-hop with Pat and Pat. So except for one piece that I am not showing (the one for the convergence quilt) here they are! I swear my stash smiled when these guys came to the neighborhood. I delayed this from posting and I managed to do a bit of sewing, so now you get to see the next border for the convergence quilt. This is the other fabric I bought on the outer borders. And the top draped over a recliner. 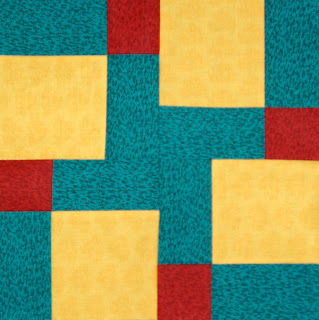 Didn't The 3 Wild Quilters pick a great POP fabric? I have to tell you that the colors are much better in person. You know, this didn't turn out to be a short post after all! On Thursday, I was able to take a day off work to meet with a couple of cyber friends. One lives in visiting distance but the other is far away. She lives in Delaware to be exact. The one in "visiting distance" isn't really that close. With traffic I figure she is about two and a half to three hours away. We arranged a meeting time and place that worked out well. Since I was meeting two ladies who are well known in the quilt blogging world I was very excited. Little did I know just how much fun I would have. You see, these two ladies are Pat from Delaware and Pat Wys. When we got together it was like meeting up with two siblings that live out of town. We just had a great time talking, eating, shopping, and riding around all over the Atlanta area. We visited three quilt shops --yes only three due to time constraints and Atlanta traffic. The first shop we visited was "A Scarlet Thread" in McDonough. (yes, all these are "greater Atlanta" or as Pat W. said "The ATL") It was in this shop that I found the next border for my convergence quilt. (Wait till you see the POP it makes. mmmmm delicious!) While we were there a class was in the classroom and when Pat showed up the instructor asked her to demo the right way to cut fabric. Honey, that Pat Wys is a born teacher. I snapped a picture --did you expect less???? Notice that her left hand is securing the ruler but is safely away from the blade area? She did a great job. Then we wondered on to lunch. Since Pat from Delaware had never had proper Southern barbeque, Pat W. decided we would go to Williamson Brothers BBQ. Good choice. I enjoyed the BBQ sandwich and the coleslaw I got. Pat enjoyed hers too, I believe. Then we went across the street to Little Quilts in Roswell GA. That is where this picture was taken. Pat from Delaware, Pat Wys and ME! ﻿This shop was interesting. They had some amazing quilts on the walls. I found some Batiks on clearance so I got a couple of yards. Then our final stop was Tiny Stitches in Marietta, GA. They have an entire room of clearance fabrics. I restrained myself, but I did get a yard of a rich red batik and one yard each of two Laurel Burch fabrics. Pat Wys and I taught Pat from Delaware a few things about being Southern. She can now say "I am fixin' to...." meaning "I am about to (do something)" She can also say "Bless her heart" or "She ain't right" meaning that the she in question is either crazy or made a major faux pas! When I was about halfway home the rain started freezing on my windshield wipers. But the roads stayed clear and I made it home safely. And just so you know, I was gone from 7 a.m. (central time) until 5:30p.m. (central time) but it did not SEEM like a long day at all. Did I mention that chocolate was eaten? Did I even need to mention it? My next post should have pictures of my fabric purchases. After reading all the comments and of course thinking my way through the process, the lightbulb went on. 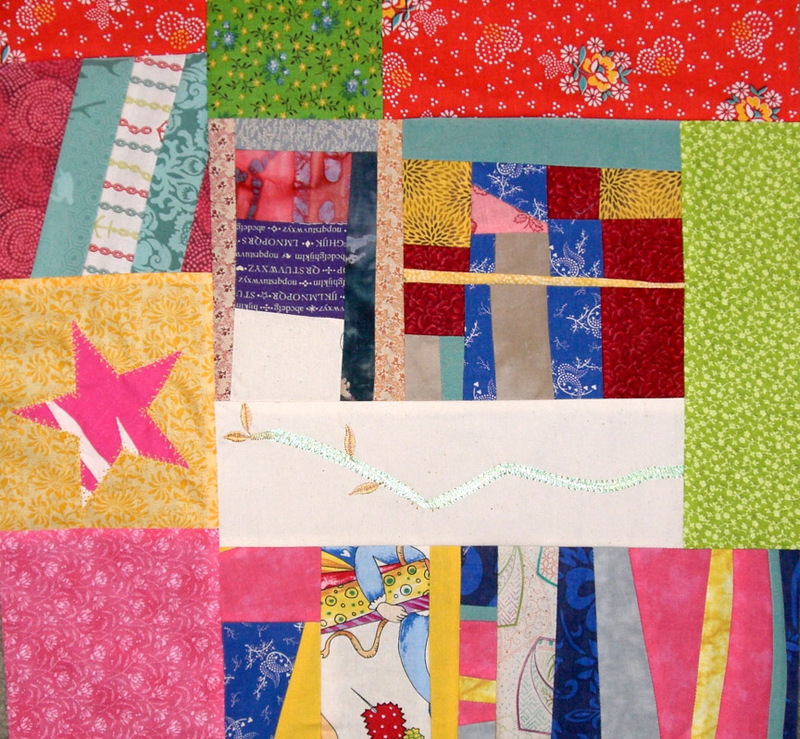 The Convergence Quilt is changed again. I cut one of the two sections in half and added it to the opposite side. 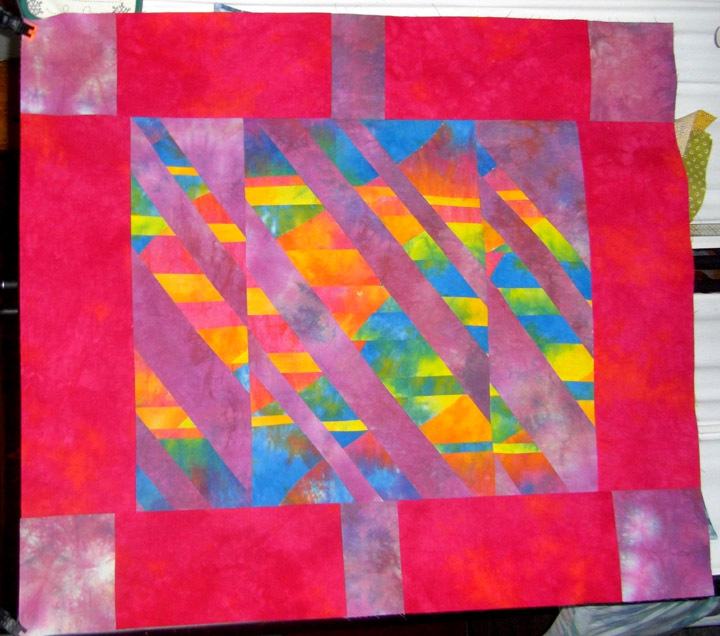 Then I grabbed a fabric to border it with and cut the border pieces. I sewed on two of them, ironed pressed the seams flat and took a good look at it. GAG!!! UGH! YUCK!!! The seam ripper got a little workout removing those two pieces. I chose another fabric and this time I did a proper audition. I liked it. I sew the two end pieces on, ironed pressed the seams flat OOOH NICE!!!! Then I went to cut the top and bottom borders. YIKES There is not enough fabric left. What to do??? 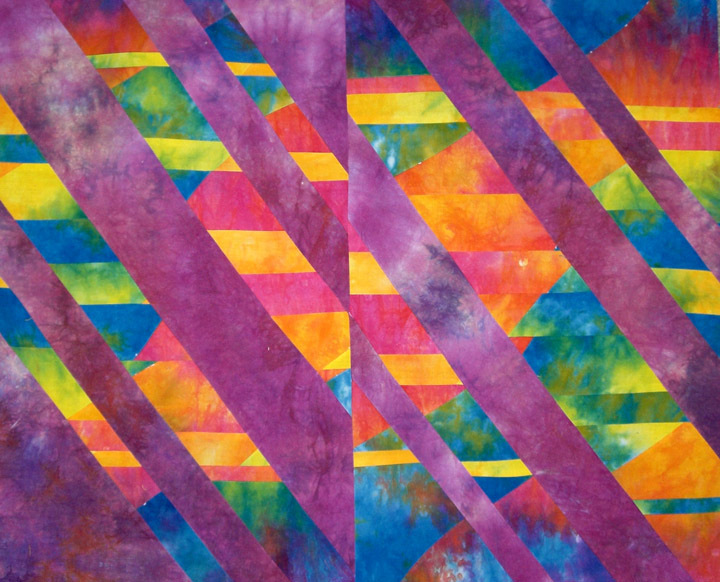 I had some of the purple that was added on the angle convergence. 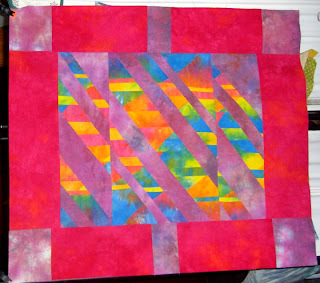 I cut some pieces and pieced those borders as you can see here. Notice that the corner stones do not connect to the center piece? That is NOT a mistake, I planned that. Now I am thinking about adding a darker purple/violet hand dyed edging around this. Or maybe an interesting green? What do you think? Angles and Colors and Re-Converging. A few days ago I posted a picture of some Fabric and a Book. 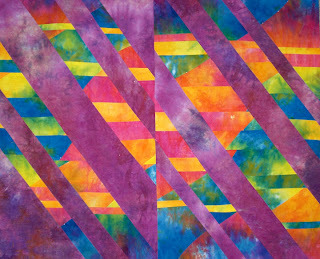 The book is Convergence Quilts by Ricky Tims. It is okay it actually looks better in this picture than it did in person. Regardless, I wasn't thrilled with the results. I had several ideas. Then I said "What if I....."
So tonight I took some purple fabric, cause purple is fun and yummy, and did a wild angle cut and re-converged it. I really like everything about this EXCEPT that glaring center seam. The whole shape and flow changed due to the angle cut. Why? Well I learned a valuable lesson - you can't merge all the strips when you cut on an angle like you can when you cut on the vertical and horizontal. 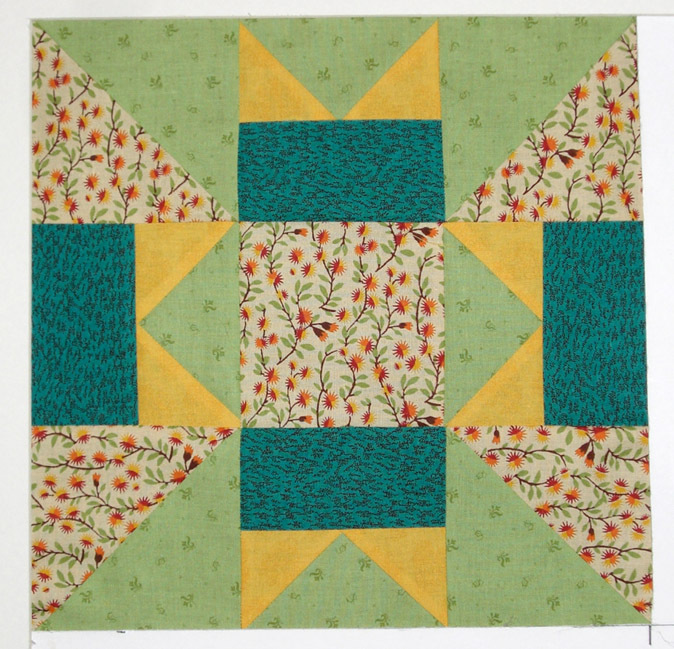 That said, I will probably put this fun piece into a lap quilt. I might even set it in at an odd angle just to add to the interesting look it has already. I do think that the re-convergence helped the convergence to pop. It was a fun experiment in sewing and fabric manipulation.